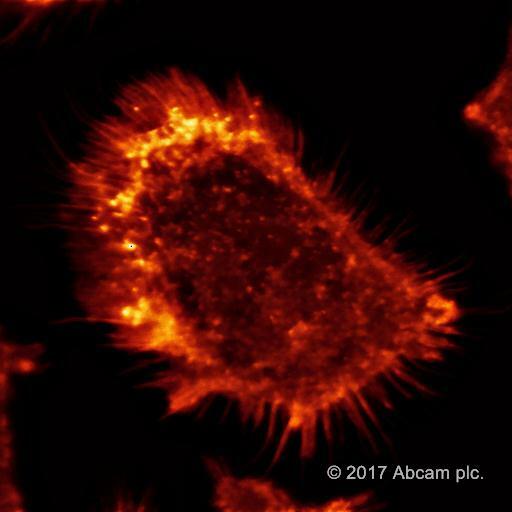 Phalloidin-iFluor 488 Reagent ab176753 is one of a series of phalloidin conjugates that bind to actin filaments, also known as F-actin. 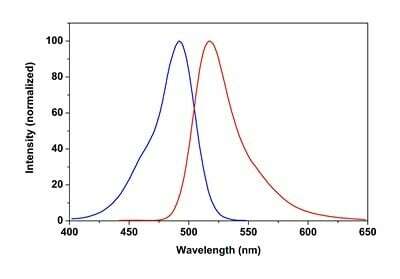 The iFluor 488 dye can be easily detected with a fluorescent microscope at Ex/Em = 493/517 nm. 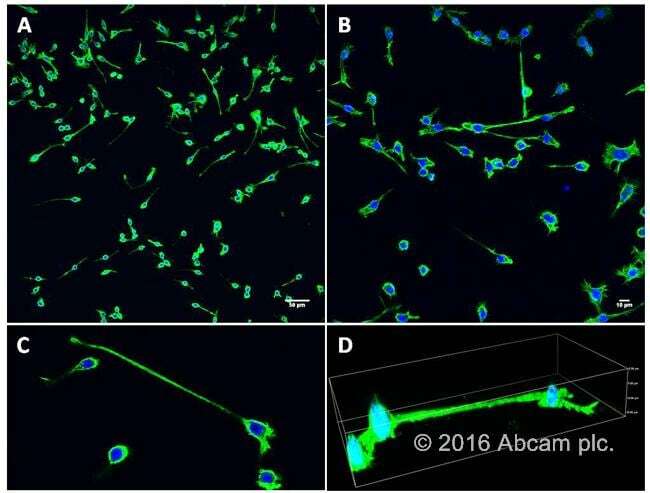 Our phalloidin conjugates are convenient probes for labeling, identifying and quantifying animal or plant actin filaments in formaldehyde-fixed and permeabilized tissue sections, cell cultures or cell-free experiments. They can also be used with paraffin-embedded samples that have been de-paraffinized. Review our other popular phalloidin dye conjugates, including Phalloidin-iFluor 647, Phalloidin-iFluor 594, Phalloidin-iFluor 555, and Rhodamine Phalloidin, or search our website to see the rest of the range. Staining fixed cell or tissue samples with phalloidin conjugates is very simple; it requires a single 20-90 min incubation with the phalloidin, followed by 3 short wash steps. 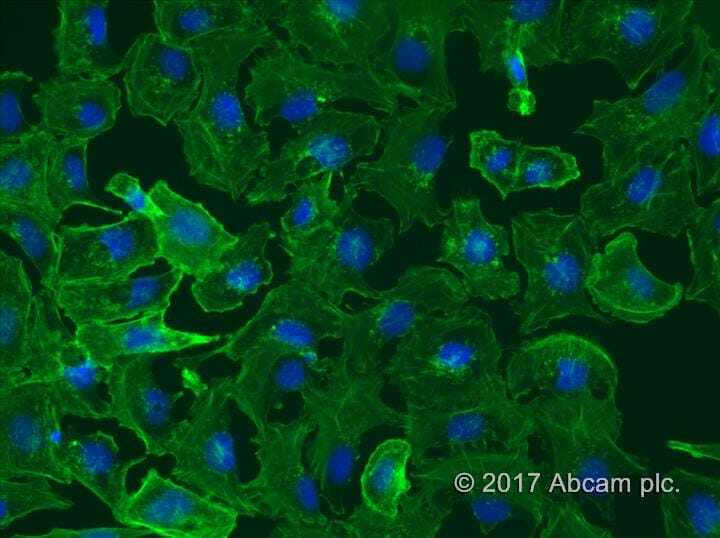 Phalloidin staining can be combined with antibody-based staining by adding the phalloidin conjugate during either the primary or secondary antibody incubation step. When used in unfixed samples, phalloidin binding leads to a decrease in the disassociation rate of actin subunits from the ends of actin filaments, essentially stabilizing actin filaments through the prevention of filament depolymerisation. 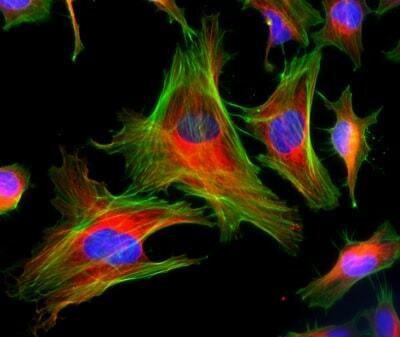 Actin filaments staining in HeLa cells. Actin filaments (green) were stained with CytoPainter Phalloidin-iFluor 488 reagent (ab176753); tubulin filaments were stained with a mouse anti-tubulin antibody/goat anti-mouse IgG (red). Nuclei were stained with Hoechst 33342. Excitation and emission spectra of phalloidin-iFluor 488 reagent. Publishing research using ab176753? Please let us know so that we can cite the reference in this datasheet. I used abcam's phalloidin-488 for whole mount IF of mouse inner ear (sensory epithelia). It stains actin so stereocilia are stained very strong. Diluted 1:1000 in PBS and incubated for 2 hours in RT. Seeding of 200.000 cells/well on cover slips in a 24-well-plate overnight. 20 min fixation with 4% PFA at room temperature. 3 x 5 min washing with PBS 0.1% Tween. Phalloidin staining for 1 hour at room temperature in the dark: 100 µl of 1x reagent diluted in PBS 0.1% Triton-X 100 1.5% BSA per coverslip. 3 x 5 min PBS 0.1% Tween. Mounting of coverslips with ProLong Gold Antifade Mountant with DAPI on microscope slides. Drying overnight at 4°C and imaging on the next day. CytoPainter Phalloidin-iFluor 488 Reagent is an excellent stain yielding great results at low expenses in comparison to other more expensive stains from competing companies. Excellent product for F-Actin staining. Very bright, yields minimal background if any when used correctly. Can be used for z-stacking without losing the signal in steps. For our experiments, the macrophage J774A.1 cell line was placed in 24-well tissue culture plates containing round glass coverslips. After 24h, cells were washed four times and fixed with cold paraformaldehyde (3.2% in PBS) for 20 min at room temperature. After being fixed, the cells were permeabilized with Triton X-100 (0.1% in PBS) for 5 min at room temperature and washed four times with PBS. CytoPainter Phalloidin-iFluor 488 (1:1000 dilution in 1%BSA-PBS), which binds polymerized F-actin, was used to identify actin filaments and fibers. Coverslips were mounted on glass slides with mounting medium containing DAPI. 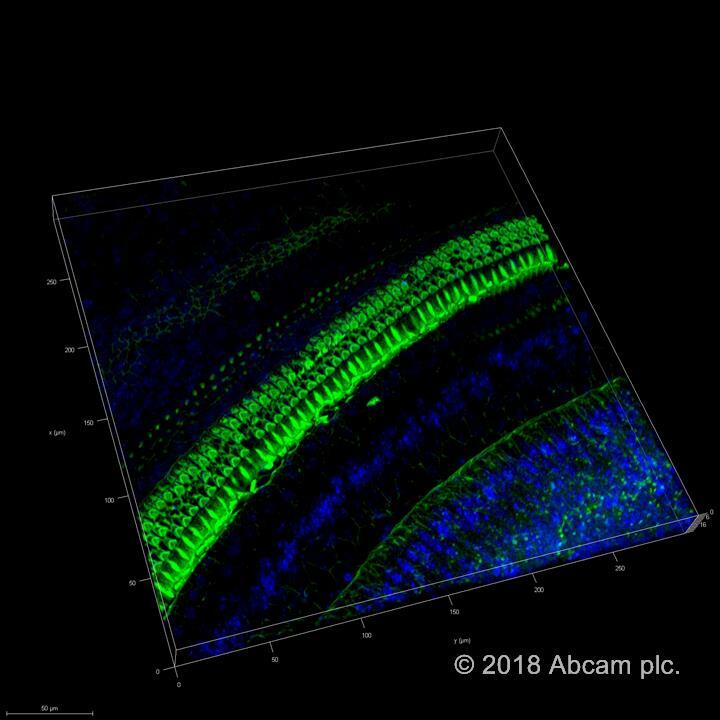 Preparations were examined with a Nikon A1R confocal scanning laser microscope equipped with 405nm/450nm (DAPI) and 488nm/525nm (CytoPainter iFluor) lasers. Images were captured at random with a ×20 (A), ×40 (B) or ×60 (C, D) objectives, and processed using the NIS-Elements 3.2 software. Scale bars: A, 50µm B, 10 µm. Huh-7 cells: 30 min incubation including 5 min prior treatment with 0.1% Triton-X.